I looted a Sargasso Spear after killing 4 mobs; 2 a siren beguiler, and 2 a siren myrmidon. I basically swam down the water tube then across a short tunnel that surfaces inside an orange colored room. I didn't even move from the room. I killed 2 static beguilers and 2 myrmidon roamers and bam. The picture icon for the 'Sargasso Spear' is the same as 'Swordfish Bill' that drops far too commonly off the 'a swordfish' so be careful not to habitually delete the SS accidently. my question is if the spear is VISIBLE on the mobs? Had this drop for me today (24August) off a siren beguiler. You caught me on a day when I'm throwing seven kinds of smoke. had one drop form a neriad sea princess- wanted the shawl though- does the neriad shawl still drop? We were about to raid Faleniel for a guildies epic 1,5. When we ascended out of the water under the temple we got a load of adds. After the carnage was done without any losses a neat necro 55 pet buff spell and this spear dropped. One dropped today on Bertox off a Neriad Princess. Purchased this item in the bazaar to use with a shaman/pally combo. It procs quite often, but the snare duration seems to be completely random. We have had snares blow immediately (similar to root) and have hand ones that last through the mobs death and everything in between. Is this a bug or is it "working as intended"? moved comment to spell effect page Embrace of the Kelpmaiden. 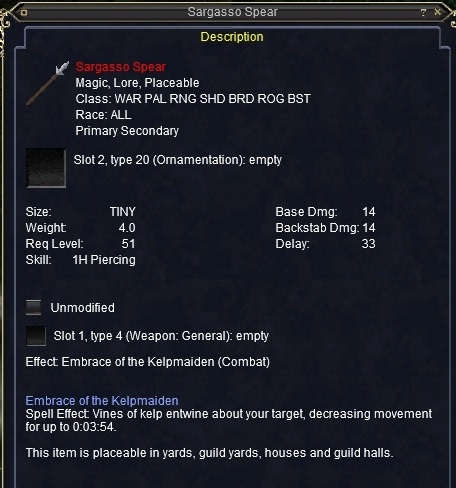 This spear dropped 2/09/04 off a Siren Myrmidon at the base of the stairs to the Mistress's temple area on the WW side of Siren's Grotto. Killed a few dozen of the Siren Myrmidons. Only one spear drop so far. Beta released: "Just wait till live, it'll all be better then"
3.0 released: "Just wait till 80, it'll all be better then"
People hit 80: "Just wait till resil cap, it'll all be better then"
People cap resil: "Just wait till next season, it'll all be better then"
The fact that a Shaman cannot use this is completely ridiculous. drops uncommonly from "a siren myrmidion" (spelling?) in the lower palace area on the WW side of the zone.